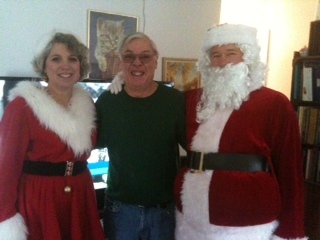 Our longtime volunteers Rich & Lori Campbell always bring smiles to the seniors on their list. Sometimes, just hearing Santa say you were good this year and that the community has sent special gifts for you touches the hearts of those we visit. Many times we see the Santa photo from the year before hanging on the fridge or sitting on a shelf…memorable visits create beautiful memories for those we see.